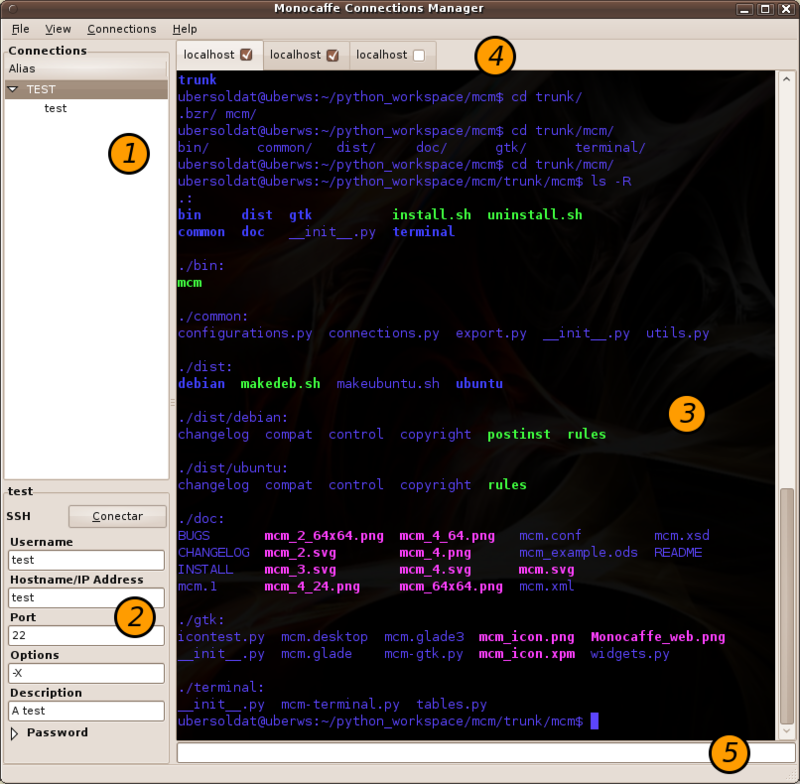 Monocaffe Connections Manager is a set of tools to ease the management of several servers. It's aimed at network or system administrators who need to connect every day to different servers by different means. It can be used via an ncurses interface without requiring an X server, and it can be used via a GNOME-based GUI. * Modify the console colors, transparency, etc. * Copy/Paste from/to the console. * Search google using selected text on the console. * Set the terminal title to the selected text. * Easy installation on Ubuntu. The Connections Tree separated in groups. From here you select a connection previously created and its information will appear on (2). By double clicking the connection will proceed. Tabbed windows with the different connections established. To open a connection on the local machine, you can press the small "Home" button beside the tabs. Tabs for the different established connections. You can navigate the tabs using the Alt+# combination. When any of the checkboxes in the tabs are activated, clustered commands (5) are enabled on the selected tabs. Clustered commands entry. Everything typed here will be sent to the selected terminals in (4). Why call an application written in python -or in whatever programming language- mono-something? A *lot* of people, and certainly no serious admin, will touch a Mono-.NET application with a ten foot pole. Too bad that the name of your application will have negative consequences for the adoption of your program.